And Happy Holiday Shopping from the Afternoon Tea, Chat and Treasuries Etsy Team of Shops! We have some fabulous Christmas Gift Ideas for you that are all under $20.00. Look at Fashionista Fox ready to go holiday shopping! So cute and only $19.00 from Felt4Soul. This Fox Fashionista is an eye catching figurine. She is modern, fashionable and has a right attitude. She is wearing a beautiful green necklace and posh designer handbag. It will make a very special gift for a special lady. This figurine is crafted using the art of needle felting. And speaking of Fashionistas – Wow! What a gorgeous bow from AmyWonderland! And $5.00! You can stop by and pick from many different colors. 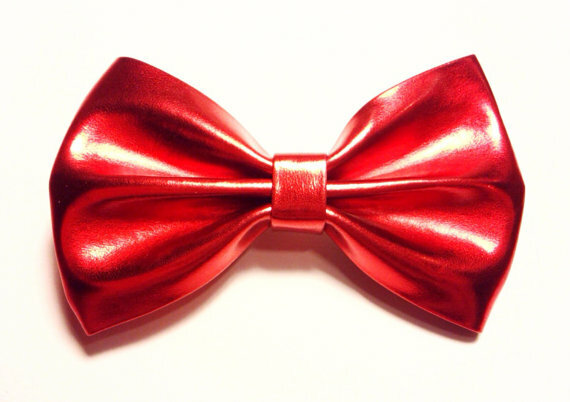 Glossy candy apple red faux leather fabric, stitched into a beautiful bow. Sewn by hand with loving care. The edges of the faux leather are resistant to fraying. Cruelty-free products were used to put your mind at ease. This bow has a lovely, glossy sheen finish. How about a cup cozy? This will make a fabulous gift for everyone on your list. $9.99 from socksandmittens. This cute hand knit gray cup cozy is great to protect your fingers from the heat of a hot cup of tea or coffee. It is designed to fit a 9 oz mug or cup, about 3″ in diameter. It is stretchy and has a loop and a chocolate brown button to fit around your mug and through the handle. Jingle Bells, Jingle Bells…. And Lip Balm! Fun and practical gift for the lady on the go. A Chapstick Holder Keychain – $9.00 from Studio 3B. This lip balm holder was made using white denim fabric and a red print cotton fabric, and has a key ring so that you can easily carry your keys on this, and features a Jingle Bell (that Jingles!) and a large lobster claw clasp so that you can also clip it and carry. P.S. Lip Balm is included! Get your kicks on Route 66! What a unique gift idea! $16.95, from SAjolie. This is such a beautiful charm bracelet which you can personalize by choosing the color of your Swarovski Birthstone charm. Comes beautifully boxed. This is just too fun! A notebook for you to write your list of things that you were right about! Only $6.46 from Alfamarama. Great stocking stuffer idea. Original MOLESKINE® notebook upcycled with a hand screen printed sentence on the cover. Individually hand printed with the sentence “my list of things I was right about”! Bring on the Bling!! Very stunning multi- color floral cocktail ring. $15.00 from victoriascharms. You may need to gift yourself with this beauty. This ring consists of a big silver flower button with 2 layers of rich colorful stones. It measures approximately 1 3/4 inches. It will fit any finger as it is attached to an adjustable silver plate ring base. You can choose your favorite colors, and it can be personalized with your child’s name, nickname, favorite sports team, or school name. The spoons are coated with polymer clay and baked at the appropriate temperature for hardness and lacquered with acrylic base for protection. It is safe for use and hand washable. This is such a cool zipper pouch with a cute bulldog in glasses, on a handsome piece of cotton canvas fabric, bright blue, teal blue, red or gold, your choice. So incredible for a piece of fabric!! So much fun! This sweet fabric pouch is so perfect for the dog lover in your life! What a great and unique gift this would make! Or keep for yourself. This list was so fun to put together, but that’s not all we have to show you – Not by a long shot. I hope you enjoy looking through all the wonderful items that are listed and enjoy shopping in our Team Shops. A Very Merry to you all!